Bertolt Hoover, otherwise known as the Colossal Titan in Attack on Titan is perhaps the most imposing fictitious creature ever to exist. With his exposed muscle and bone, the terrifying giant has a mighty appetite for humans. Apparently he also likes cookies. Who doesn’t? 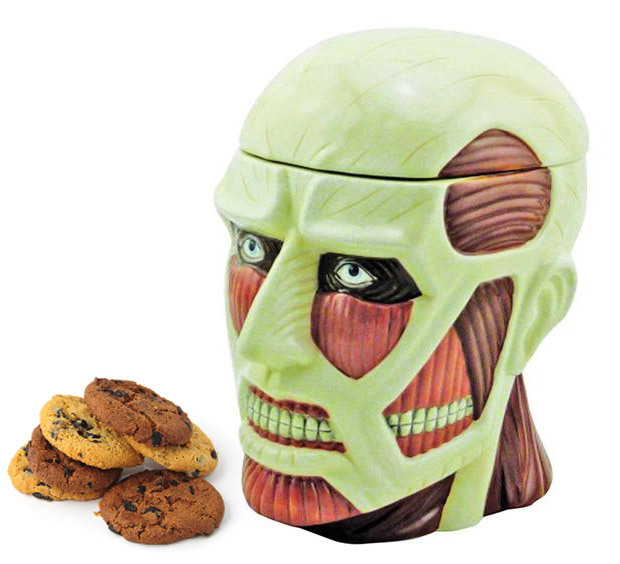 Classic Imports’ Colossal Titan cookie jar is sure to keep your kids’ grubby little mitts off your cookies for fear that their hands will be devoured by this monster’s seemingly endless rows of gnashing teeth. Head on over to Big Bad Toy Store or Entertainment Earth to pre-order yours now.